ESSENCE is a gentle giant. His spectacular performance, powerful rear end, and muscular top will not be outdone by his friendly disposition. 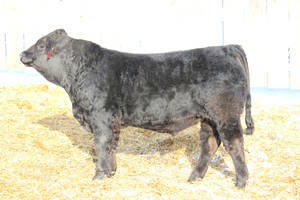 His is near the top of the sale offering for his Weaning Wt. and Yearling Wt. EPD tabulations. His first calf dam is a moderate, heavy-milking and gentle SEMINOLE daughter while his grandmother is an ASA Silver Dam with an average weaning ratio of 103 on her 4 calves. She is also the mother of the bull selling LOT 126. Quad-polled and smooth polled. 37.5% Angus.